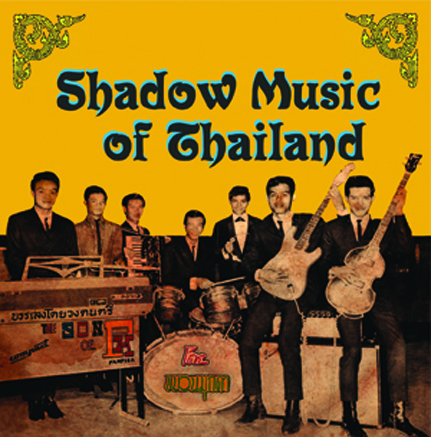 SHADOW MUSIC was a broad term given to the Thai guitar pop movement of the 1960s and the groups that came out of it, all under the profound influence of early Western rock and roll. British instrumental wonders The Shadows (as in Cliff Richards & the Shadows) were the origin of the genre's title, also coined 'Wong Shadow' or early Thai 'String' music. Shadow records were often marketed as 'Thai Modernized Music' which it was in the truest sense. Traditional Thai melodies were given the Shadow treatment; incorporating rock, surf, a-go-go, exotica, soul, blues, Latin and other worldly styles of the times. Inventive compositions and instrumental genius meet the occasional odd vocal arrangement and the results range from plaintive guitar and organ-driven lullabies to full-blown electric garage folk-psychedelia! Featured on this collection are a handful of the leading recorded artists from the time; P.M. Pocket Music, The Son of P.M., P.M.7, Jupiter and Johnny Guitar. Throughout the 1960s, these groups forged a unique and highly self-referential Thai sound. One time pressing of 1500 LP copies and each of these beauties come in a full-color heavy-duty tip-on gatefold jacket featuring gorgeous original Thai Shadow LP artwork and of course 180 gram vinyl.